We’d love your help. 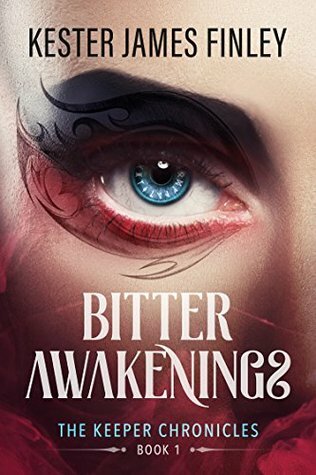 Let us know what’s wrong with this preview of Bitter Awakenings by Kester James Finley. Southern charm meets devilish intent. Being nearly immortal and stuck in the body of a young girl alongside an injured demon has been a long road for Truddie Mae. As a Keeper, blessed by the fates to protect the veil using supernatural magic, she has grown weary from lack of excitement. Nestled within the swampy wilderness of her Florida home, her existence will soon be thr Southern charm meets devilish intent. Being nearly immortal and stuck in the body of a young girl alongside an injured demon has been a long road for Truddie Mae. As a Keeper, blessed by the fates to protect the veil using supernatural magic, she has grown weary from lack of excitement. Nestled within the swampy wilderness of her Florida home, her existence will soon be threatened. The veil, a magical barrier between our world and the astral planes, is in distress urging for her help against a sinister new enemy that has breached this reality. Driven by a ravenous appetite for energy, it will stop at nothing until everything is consumed. Now, forced to work alongside a tri-blooded enigma, a nature mage, and a snobby ice enchantress, she must race to rescue others in its path and stop this wicked threat from ultimately unraveling the entire universe. To ask other readers questions about Bitter Awakenings, please sign up. A decent read, a decent first offering from a starting author. The plot does seem to move around, as do the locations, but I found it kept the pace up and sort of sets the groundwork for more installments of the series, especially how this one ended. I enjoyed the characters, their back and forth banter, and the supernatural feel of the story. Overall, a good afternoon or lazy weekend read and will be looking for future books of the series. Kester James Finley is an author of paranormal and supernatural urban fantasy books. His work includes "The Keeper Chronicles" series and an, as of yet to be published, young adult fantasy series currently in the works. Kester is a proud member of the Independent Author Network and received the September 2017- Silver Literary Titan Book Award for his first novel "Bitter Awakenings", a paranormal a Kester James Finley is an author of paranormal and supernatural urban fantasy books. His work includes "The Keeper Chronicles" series and an, as of yet to be published, young adult fantasy series currently in the works. Kester is a proud member of the Independent Author Network and received the September 2017- Silver Literary Titan Book Award for his first novel "Bitter Awakenings", a paranormal and supernatural fantasy filled with magical realism. A graduate of Saint Leo University, Kester received a BA in Psych and graduated with honors, as figuring out what makes people tick and tock turned into something more than a hobby. As a Florida native, Kester spent his younger years watching horror films, collecting comics, and writing in his spare time as an escape from the evilness of sunlight. He grew up in Zephyrhills, Florida before moving to Spring Hill, Florida where he currently resides with his partner Joe and their demon spawn of a cat, Tucker.